Just imagine it. There you are, mentally ready and eager; but nerves and those pesky butterflies are holding you back. The next thing you know, you are pacing the floor and ringing your hands. Is that the pits or what, your becoming unhinged over a few uncooperative butterflies? Indeed it is! This article helps you get control of those butterflies and give your success your best. Just imagine it. There you are, mentally ready and eager; but those pesky butterflies refuse to fly in formation. The next thing you know, you are pacing the floor, ringing your hands, and quoting Charles Dickens, "Oh the nerves, the nerves; the mysteries of this machine called man! Oh the little that unhinges it, poor creatures that we are!" Is that the pits or what, your becoming unhinged over a few uncooperative butterflies? Indeed it is! It's every bit as bad as Arthur Somers suggested, "Anxiety is a thin stream of fear trickling through the mind. If encouraged, it cuts a channel into which all other thoughts are drained;" and that channel just keeps getting deeper. Fortunately, there are only three basic butterflies, only three that actually matter. Getting them to fly in formation isn't that big of a deal. You only need to identify them and then figure out where each goes in the formation. The secret principle for getting butterflies to fly in formation is called the To It Principle. It includes three sub-principles which, coincidentally, happen to match exactly with the number of butterflies you are trying to get to fly in formation. Now how cool is that, one sub-principle per butterfly? The first sub-principle is the Up To It Principle. Assign that one to your lead butterfly. You are either up to it or you aren't. Sure, worrying about whether you are up to it is the basis of your anxiety, what is getting you unhinged. Even so, the only way to determine whether you are up to it is to take a deep breath and get started. Worrying and putting off getting started just cuts that channel Somers pointed out even deeper. That's why you need the second sub-principle for getting butterflies to fly in formation. It's the Around To It Principle. You keep telling yourself that you will get started one of these days, when you get around to it. Well, assign the sub-principle to the second butterfly and put that reluctant flyer in the formation, just behind the left wing of your lead butterfly. You either get around to it today or you likely never get around to it at all. Okay, you are up to it and have finally gotten around to it. You are ready for the third sub-principle. It's the Down To It Principle. This one is definitely not rocket science. Since you are up to it and have finally gotten around to it, it's time to get down to it, do what you need to do. Assign that job to the third butterfly and slip it just behind the right wing of your lead butterfly. There you go, your butterflies in a tight formation. As it turns out, there isn't any trick to it; and, if you'll excuse the pun, that's no Bull. 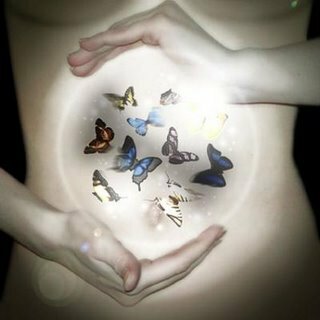 You are nearly ready to go; you have those pesky butterflies in tight formation, leading you to your glorious future. There are just a couple more things you need to know as you pursue your success. You have a job only you can do. The job you have is being you. At the end of each day you must take a test. Did you give being you your very best? e. e. Cummings had some words that will take you pretty far. "It takes courage to grow up and become who you really are." The challenge is never giving your courage a rest. That's how you give being you your best. Raymond Hull also had something important to say. "He who trims himself to suit everyone will soon whittle himself away." What that means you've already guessed. You have to be just you to give being you your best. You can't be who other people want you to be. You can't be a spider or a bird in a tree. The spider has its web and the bird has its nest; but you have something special when you give being you your best. Judy Garland didn't find her advice on a shelf. "Always be a first-rate version of yourself;" and Johann von Goethe's message wasn't a surprise, "If God had wanted me otherwise, He would have created me otherwise."